Lattix supports powerful integration with high-quality static analysis tools like KlocWork. This is good news for serious development companies that need to ship high-quality code. The integration of Lattix means that errors as detected by KlocWork show up in the Dependency Structure Matrix. The visualisation of results of both tools in a Dependency Structure Matrix makes it easy to find the hot spots of possible defects and defective code. Based on this information well thought-out decisions can be made. In the Apache Web Server example in the DSM above it is shown that most of the defects found by Klocwork show up in modules. 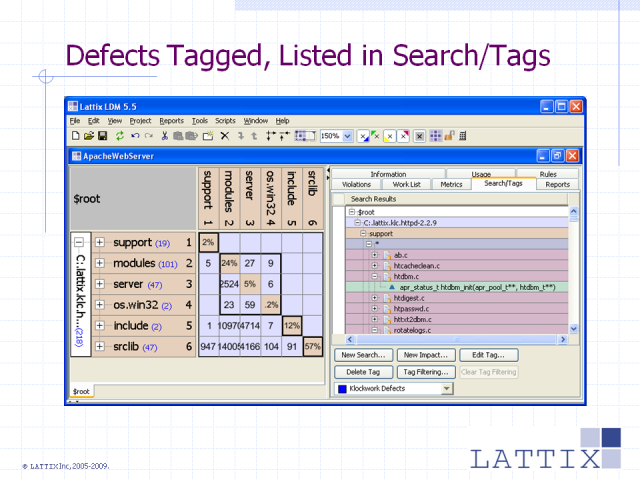 Lattix directly connects to the Klocwork database to retrieve the error information. This means that it is easily possible to obtain the latest results.